Most people who join our third-party sales channel are commercially astute and have some previous experience in FMCG or sales. Strong communication and team-playing skills are important. You also need to have a real can-do attitude and an analytical approach. Wherever you start off in our Sales department, there will be plenty of opportunity for you to move between functions and channels. You will also be able to gain experience through a combination of desk-based and field-based roles. Explore our Sales teams to see where you fit in. 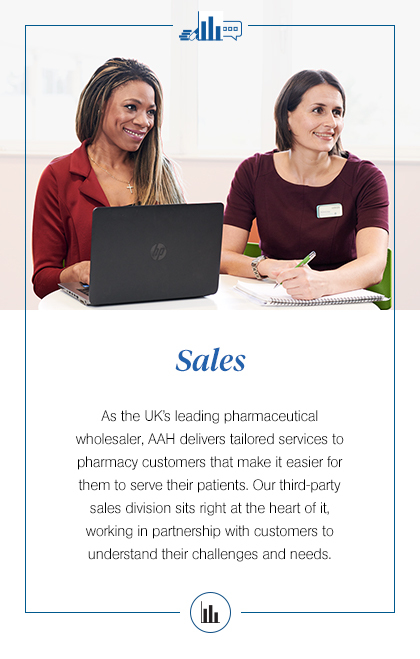 These teams specialise in providing sales support to large multiple pharmacy chains and supermarkets. Works on propositions for our pharmacy customers and analyses data to identify CRM trends. Opportunities within our travel health business. Typical roles include Business Development Manager, Teleconsult Nurse and Customer Service Advisor. Uses our nationwide community pharmacy network to manage and support outstanding public health services. Typical roles here include Commissioned Services Advisor and Local Contract Manager. Given the great global business we’re part of, the opportunities are endless. Pushing forward with leaders of the future. No 2 days are the same here which is great because I get to work on a variety of different things.